And now you have the perfect excuse to stay indoors and treat yourselves to some warm and comforting plant-powered recipes. 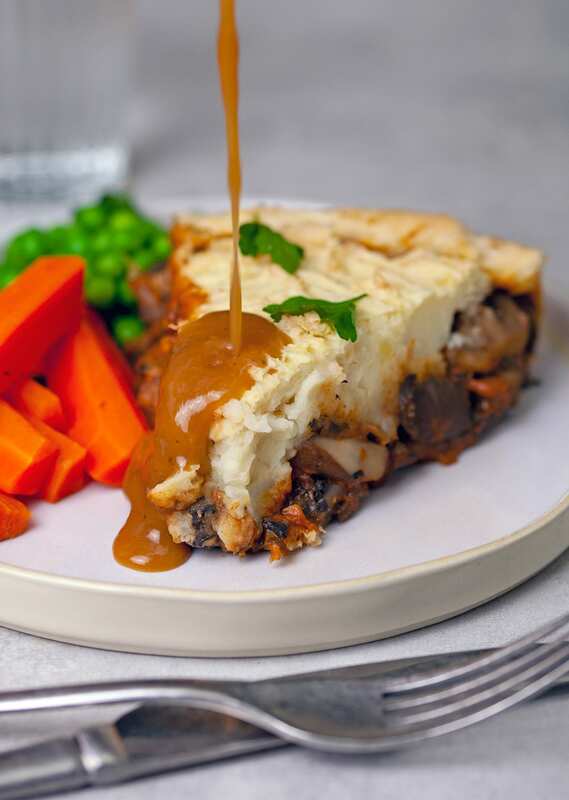 We’ve been really excited about sharing this new recipe for mushroom stroganoff pie. It’s rich, filling, really simple to make and it’s great for a lazy Sunday afternoon. And if you love this recipe, then don’t forget our debut cookbook So Vegan in 5 is available to pre-order right now! We garnish with extra parsley and serve with peas, carrots and gravy. Yum! Peel and slice the shallots, then peel and dice the garlic. Heat 1 tbsp of margarine in a large pan on a medium heat, then add the shallots and garlic. Fry for 5 minutes, stirring frequently, until the shallots are caramelised. Roughly chop the mushrooms. Add them to the pan and fry for 12-15 minutes, until most of the moisture has evaporated. Meanwhile peel and roughly dice the potatoes. Add the diced potato to a saucepan of cold water. Bring to the boil, then simmer for 15 minutes or until the potato is completely soft. Next, add the wine to the pan, give everything a good stir and simmer for 4-5 minutes so the alcohol evaporates. Then add the veg stock along with the paprika, Dijon mustard, miso paste, soya cream, salt and pepper and 2 tbsp of the flour. Then roughly chop the parsley, discarding any big stalks, and add it to the pan. Stir everything together, making sure no large lumps of flour remain, and leave to simmer on a low heat for 5 minutes until the sauce thickens up. Preheat the oven to 180°C (350°F) fan. When the potato has finished boiling, drain it and add it back to the saucepan. Add the dairy-free margarine, soya milk and a pinch of salt and pepper. Use a potato masher to combine everything until smooth, then set aside. Roll out the puff pastry so it’s large enough to cover the bottom and the sides of a 20cm oven-proof pan. Then carefully place it on top of the oven-proof pan, pushing down on the sides until it completely covers the surface of the pan. Sprinkle the remaining 2 tbsp of flour evenly across the base. Spoon the stroganoff into the pastry and smooth it out on top. Trim any excess dough that hangs over the edges and fold the edges back in on themselves to create a thick crust at the top. 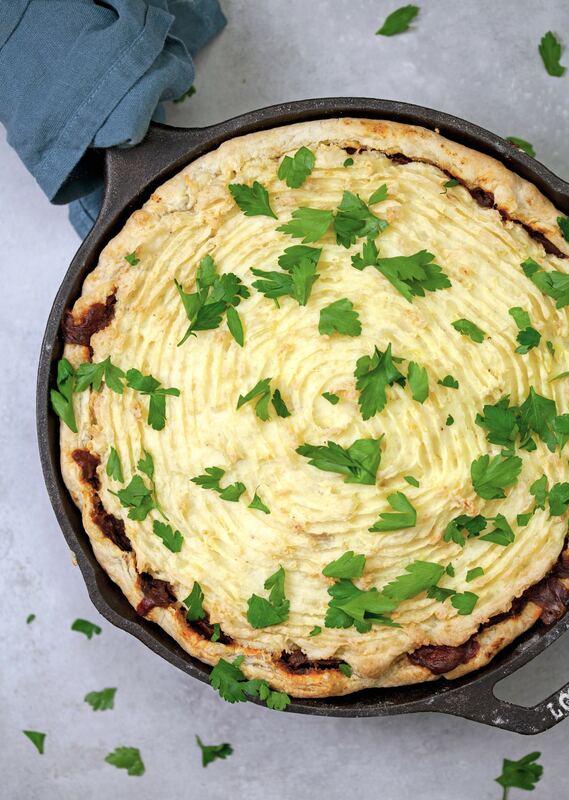 Then spoon the mashed potato on top of the stroganoff so it covers the entire mixture and use the prongs of a fork to create a spiral pattern. 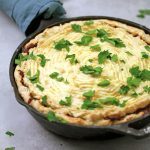 Brush the pastry edges with a little soya milk, then bake in the oven for 25 – 30 minutes until the pastry is golden brown and the mashed potato is crispy on top. Remove the pie from the oven and leave it to set for 10 minutes before serving. Serve with an extra sprinkling of parsley leaves, your favourite veggies and some gravy. Is it possible to provide the gravy recipe? Please and thank you soooo much! Hi Helen, lovely to hear from you. We usually make up the gravy on the spot, but tends to includes vegetable stock, Marmite, nutritional yeast, pepper and some plain flour for thickening. Start by heating the stock in a saucepan, then start adding small quantities of the remaining ingredients until you’re happy with the flavour. Hope that helps! Thanks, Roxy. Can’t wait to make this – thank you! Also what ingredients do you use for gravy…tamari, flour, water and miso? Thanks so much! Hi Nancy! Thanks for reaching out. 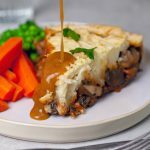 We usually make up the gravy on the spot, but tends to includes vegetable stock, Marmite, nutritional yeast, pepper and some plain flour for thickening. Start by heating the stock in a saucepan, then start adding small quantities of the remaining ingredients until you’re happy with the flavour. Hope that helps! Thanks, Roxy. We are soy free, can you recommend a substitute? I am making my own cashew cream. Soak cashew with some water over night and blend the next day- done. 🙂 You can use hemp, almond, rice, oat or other vegan milk.